Galileo's 1632 book, Dialogue on the Two Chief World Systems, Ptolemaic and Copernican, comes alive for twentieth-century readers thanks to Maurice Finocchiaro's brilliant new translation and presentation. Condemned by the Inquisition for its heretical proposition that the earth revolves around the sun, Galileo's masterpiece takes the form of a debate, divided into four "days," among three highly articulate gentlemen. Finocchiaro sets the stage with his introduction, which not only provides the human and historical framework for the Dialogue but also admits the reader gracefully into the basic non-Copernican understanding of the universe that would have been shared by Galileo's original audience. The translation of the Dialogue is abridged in order to highlight its essential content, and Finocchiaro gives titles to the various parts of the debate as a guide to the principal topics. By explicating his own critical reading of this text that is itself an exercise in critical reasoning on a gripping real-life controversy, he illuminates those universal, perennial activities of the human mind that make Galileo's book a living document. This is a concrete, hands-on introduction to critical thinking. The translation has been made from the Italian text provided in volume 7 of the Critical National Edition of Galileo's complete works edited by Antonio Favaro. The translator has also consulted the 1632 edition, as well as the other previous English translations, including California's 1967 version. 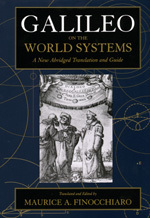 Galileo on the World Systems is a remarkably nuanced interpretation of a classic work and will give readers the tools to understand and evaluate for themselves one of the most influential scientific books in Western civilization. Maurice A. Finocchiaro is Distinguished Professor of Philosophy at the University of Nevada, Las Vegas. "This is a very creative piece of work which merits the highest praise. It should be of great value for students and for the general reader."—I. Bernard Cohen, author of Guide to Newton's "Principia"